With caffeine available in many forms these days, from coffee and energy drinks to gum and even shaving cream, there are plenty of ways to get that little pick me up. While this is convenient for the consumer, it also makes it easy to over-consume caffeine on a regular basis. But how do you know how much is too much? And what are the consequences of over-consuming? Read on to find out. When it comes to caffeine intake from all sources, the safe daily recommendation is around 400mg (4 cups of coffee or 2.5 16oz energy drinks) for healthy adults with no medical issues. This can vary depending on how much you weigh and how sensitive you are to caffeine. Many of us start the day out with a 8oz-cup of coffee and/or have an energy drink before working out. This isn't the problem. 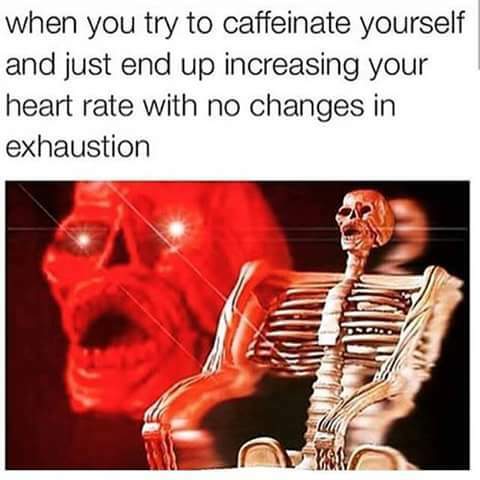 Its when that 1 cup of coffee in the morning turns into 3 cups before 12pm, a large energy drink (16oz) in the afternoon and a pre-workout containing caffeine in the evening. Lets add those up an see how much each of these individuals would be consuming. 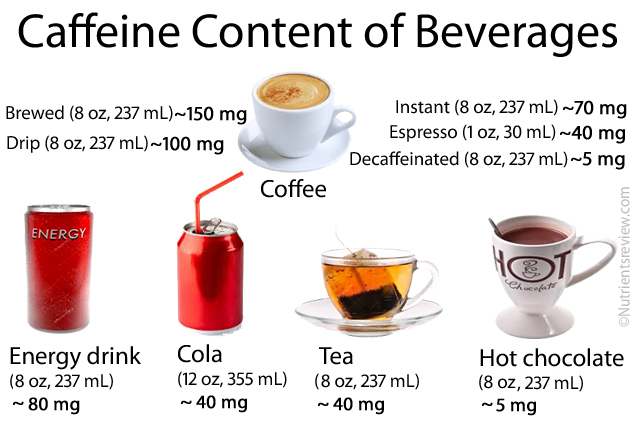 While person 2 is a rather extreme example, this is a realistic caffeine intake for some people who greatly exceed 400mg/day. 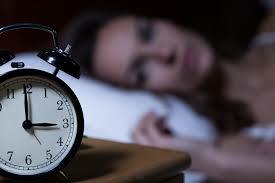 With intakes of over 400mg per day, side effects of overconsumption may show such as restlessness, insomnia, jitters, nervousness, irritability, upset stomach, fast heartbeat and frequent urination. While none of the side effects are deadly at normally ingested doses for the healthy population, they can just be annoying and uncomfortable. The purpose of this article is most definitely not to shun caffeine intake. I love me a big ol' cup of dark roast coffee, an occasional energy drink or a scoop of pre-workout before a heavy gym session. In fact there is a recent review on the health benefits of coffee (for another post). The purpose is just to raise awareness, so individuals are conscious of the amount of caffeine they are taking in. So next time your about to order that Starbucks drink with triple espresso shots, just think, how much caffeine have I had today? Do you keep track of your caffeine intake? If so, how much do you consume on a regular basis? Let me know in the comments below. (Mine is usually around 350mg daily) And until next time, BE ELITE!